Building on the popularity of cabanas offered at Disney's water parks, Disney Cruise Line, and select Walt Disney World Resort hotels, Disney will introduce new cabanas to Magic Kingdom Park on Nov. 27. 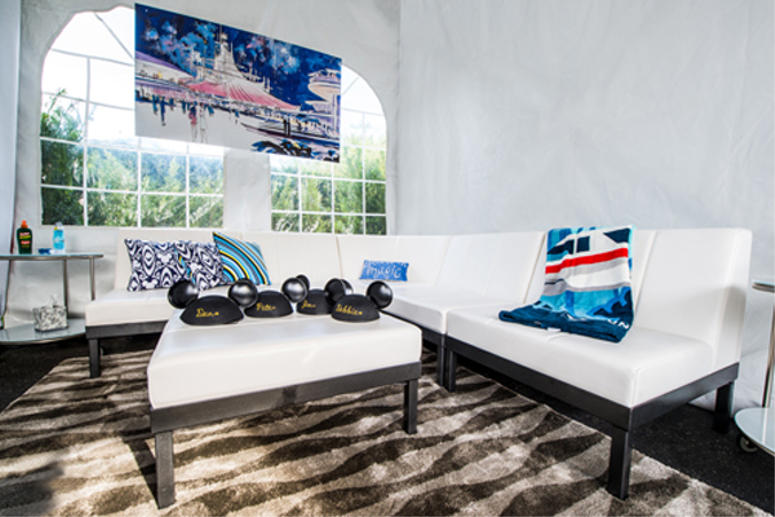 Situated in an out-of-the-way area of Tomorrowland near Space Mountain, cabanas will accommodate up to 8 Guests and will be available for a daily rental price of $649. Amenities include private seating, snacks and reserved viewing for parades and fireworks. Cabanas will be visible in the park starting November 19. Guests may be seen testing the cabanas as early as November 20. Guests may book starting November 21 for dates November 27 and beyond by calling (407) WDW-PLAY or visiting Concierge at a Walt Disney World Resort hotel. I have nothing against getting what you can afford in life. Why not ? But the Magic KIngdom has always seemed to me to be a one tiered event where, no matter your wealth or status all guests are equally privileged. The introduction of expensive cabanas is ok..........and good luck to those who can afford one. What concerns me is the reservation of the best viewing areas for the parades. These have traditionally been taken by those guests who are willing to get in place early and pay for their view by waiting for hours. Often uncomfortably. I've never done it myself but I take my hat off to those who do. They fully deserve their better view of the parades. Now, of course, it will be the preserve of the wealthy who can buy their way to these exalted places. Is this right ? Well it might not be wrong but it is a little sad. I agree with the first post. However, I'm even more cold on the cabanas themselves. They are an absolute intrusion on the otherwise immersive, themed setting, standing out like a blight on the Magic Kingdom today, and I'm sure Epcot tomorrow. Nothing but an obvious cash grab by the poor, poor Walt Disney Company. Sadly, I'm sure they'll sell as obviously there are those who can afford them, but again, the once great equalizer that a day at the park was for all classes of guests, will become a thing of the past. Before long most people will be watching the parades from behind trees and lamp posts and fireworks from the parking log. I cannot really see the point in these. We pay a high price for admission and, I assume, try to experience as many attractions as possible. Why pay extra to sit in a tent wasting valuable time? Agree that if I were to sit back and use a cabana, I'd much rather be back at my hotel room, or in this case, suite. "Amenities include private seating, snacks and reserved viewing for parades and fireworks." I see this as being the most useful part of these. Also like the picture-implied monorail towel, monogrammed ear hats and suntan lotion. All of which are cheap(er) to buy, but having them there on hand is nice. In a beach or water park setting, these things make sense. A lot of people may spend half their day sunbathing and relaxing in between swims and water rides, so having access to a cabana would be much more useful. Plopping these in a traditional theme park is weird. I'd rather go inside where there's air-conditioning than sit in one of these in the sweltering heat. This is simply unholy. There's no problem with a company trying to make a profit. But this is like United Airlines charging to use the overhead bins, or a Las Vegas club selling bottle service at 1200% the cost. This is just wrong, and if the powers that be at Disney have any sense of morality or consideration for their guests, then this idea should be scrapped immediately. What greedy pinhead came up with this idea? Gouge McCustomer? These could be a cool idea if they were not just tents. For example if you could hang out on a balcony overlooking Fantasyland, or in the second floor windows above Main Street. And what about giving away one per day to a lucky family or a family with special needs? That could be cool too! Wow this is disgusting! I knew this is what Disney has come to! Besides charging full price for a park like Hollywood studios that has half the attractions it had years ago, now it's making our pay for overpriced cabanas inside of the park if you want a private area for yourself??! Instead of these projects they should be worried about getting Star Wars land finished by the end of 2025 because they haven't even started and their projects usually take 7 years to build! New fantasyland... 6 years.... avatarland 7 years see the trend... Sad! That's why I am and have been a universal annual passholder for three years now after being a Disney one for five years I knew the parks were going down hill!